Dylan Sprayberry Photos, News, and Videos | Just Jared Jr.
Peyton List joins her gorgeous co-stars on the red carpet at the premiere of Light as a Feather held at Awesomeness HQ on Thursday night (September 27) in Santa Monica, Calif.
Stars Ajiona Alexus, Haley Ramm, Liana Liberato, Brent Rivera, Dylan Sprayberry, Jordan Rodrigues, Alex Lange, were all at the event, where they got support from Dylan‘s girlfriend, actress Samantha Logan, and Peyton‘s twin brother, Spencer. The series, which will premiere on Hulu on October 12th, follows five teen girls who play an innocent game of “Light as a Feather, Stiff as a Board” that goes wrong when they start dying off in the exact way that was predicted. The survivors are forced to figure out why they’re being targeted – and whether the evil force hunting them down is one of their own. FYI: Peyton wore a Missoma ring. Kiernan Shipka just won Throwback Thursday with the best ever photo. The 18-year-old Chilling Adventures of Sabrina actress posted the pic – featuring her with Dylan Sprayberry and Amandla Stenberg – on her Instagram, and we just can’t believe how young they all are! “You gotta start somewhere #tbt,” she captioned, before revealing it was from a Lunchables commercial they filmed together. “That’s so hilarious. I wanna see this commercial! Didn’t we film it at a school somewhere?” Dylan asked in the comments, before telling her they all needed to catch up soon. While we’re unable to find it at the moment, we’ll keep searching for it! Peyton List and Dylan Sprayberry will star as Olivia and Henry in Hulu’s upcoming horror series, Light as a Feather. 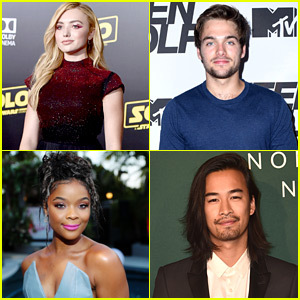 The two actors have joined Liana Liberato will play McKenna, Haley Ramm is Violet, 13 Reasons Why‘s Ajiona Alexus is Candace, Brianne Tju is Alex, The Fosters‘ Jordan Rodrigues is Trey, and influencer/actor Brent Rivera is Issac, as well as Dorian Brown Pham as Deb, Deadine reports. In the upcoming series, an innocent game of “Light as a Feather, Stiff as a Board” goes wrong – and the five teen girls who played start dying off in the exact way that was predicted. Now, the survivors to figure out why they’re being targeted – and whether the evil force hunting them down is one of their own. Tyler Posey hugs Dylan Sprayberry so tight in this pic from the Teen Wolf Series Wrap Party held at the DGA Theater on Thursday (September 21) in Los Angeles. The two were joined by almost all of the rest of the cast including showrunner Jeff Davis, Holland Roden, Dylan O’Brien, Khylin Rhambo, Tyler Hoechlin, Meagan Tandy, Froy Gutierrez, Mike C. Manning, Andrew Matarazzo, Zach Smith, Nathaniel Weller, JR Bourne, and Benjamin Wadsworth. The Teen Wolf series finale happens THIS Sunday on MTV — and NO ONE IS READY. Tyler Posey can’t keep away from the fans at the 2017 MTV Video Music Awards held at The Forum on Sunday (August 27) in Inglewood, Calif. The Teen Wolf star hit up the event with his co-stars Ian Bohen and Dylan Sprayberry to celebrate the show, while his own took a week off. Just a few days earlier, we were all treated to a first look at the series finale of Teen Wolf, and spoiler alert — Dylan O’Brien and Tyler Hoechlin are back for it! Check it out on JJJ right now! Sofia Carson just sparkles inside Variety’s Power Of Young Hollywood event held at TAO on Tuesday night (August 8) in Los Angeles. The Descendants 2 star reunited with her co-star China Anne McClain inside the event, along with China‘s sister, Sierra. Vanessa Marano, Jenna Ortega and Danielle Campbell all got the “wear red” memo and wowed with their hot looks. Other stars spotted at the event included Witney Carson, Chloe Lukasiak, Liana Liberto, Chloe Bennet, Chloe x Halle, Stranger Things‘ Shannon Purser and Gaten Matarazzo and Teen Wolf‘s Colton Haynes, Dylan Sprayberry, and Tyler Posey. FYI: Chloe L is wearing an Alexis dress. Chloe B wore an Elisabetta Franchi dress. Shannon wore a Alejandro Peraza dress, Bonheur jewelry, an Inge Christopher clutch and Aldo shoes. Jenna was in Tommy Hilfiger and Nissa jewelry.